In this review we take a look at Shopify vs Squarespace, to see which is the best solution for your website or online store. Read on to get a list of pros and cons of each platform - and do feel free to leave your thoughts on both products in the comments section below (I'd love to hear from users of both). On the face of it, Shopify and Squarespace look like similar products: they let you create a website and they let you sell products (even if you don’t have any design or coding skills). But they have a different history and started life with different purposes: Squarespace was initially conceived as a solution for building and maintaining content based websites, where as Shopify was specifically created as a solution for making an online store. With the relatively recent addition of e-commerce to Squarespace’s feature set, the two tools have become increasingly similar and technically, you can now use either to create a website or host an online store. But which is best suited for your business? Are you trying to build a website or an online store? When deciding between Squarespace and Shopify, the first question you need to ask yourself is this: what am I trying to build, a website or an online store? Of course, an online store is technically a website too, but in this context, by 'website' I'm talking about an online presence where conveying information is the priority — for example, a blog, a news site, a brochure site, a magazine, a photography portfolio etc. — and by 'online store' I mean something where selling products is the primary goal. Let's dive into the website building stuff first. If your focus is on building an informative website, then design and content management functionality are going to be a priority — and this being the case, it's fair to say that Squarespace is the obvious choice out of the two products discussed here for that purpose. Its templates are excellent; its CMS is intuitive and easy to use; its photo editing and displaying tools are superb; and its blogging features are strong. There are two versions of Squarespace to consider: the 'normal' version, used by the vast majority of Squarespace customers, and the developer's platform, which is used by web design agencies and, as the name suggests, developers. The latter is usually the best version to use if you intend to customize Squarespace very extensively, but you'll obviously need to be familiar with web development and coding in order to use it. Laying out content in Squarespace is easy, and the options for doing so are extensive. In this article I'm focussing on the standard version of Squarespace; and it's probably fair to say that whilst it provides a fairly powerful bunch of tools for presenting web content in an attractive manner, it is generally suited to working on relatively simple sites only. First, navigation is effectively limited to two levels; arguably one, in fact, as when you create a 'parent' page containing sub-pages, you can't actually view the parent page. Second, whilst you can edit basic aspects of the templates (colours and typefaces etc. ), you are generally going to be stuck with whatever Squarespace decides looks best for a particular template. Despite marketing themselves at ‘creatives’, Squarespace don’t really encourage particularly creative use of their templates — in most cases, you're dealing with a 'walled garden' in which everything is locked down fairly tightly, and if you try to get around this by adding your own lines of CSS to your template, Squarespace can be a bit hesitant in providing support. Some Squarespace templates are considerably more flexible than others however — the ‘Brine’ family of templates, for example, provides a larger range of style controls than many others. the walled garden approach, despite its faults, means that it's easy to build and maintain sites on the platform. The bottom line is that, used well, Squarespace can help you put a professional-looking site extremely quickly, and gives you a lot of nice ways to display images and blog content in a way that Shopify arguably doesn't. We build both Squarespace and Shopify websites. Please do contact us today for more information on how we can get your Squarespace or Shopify website off the ground quickly and professionally. If you need to enhance the functionality of your Squarespace website, do check out our new Squarespace plugins store. Where the Shopify vs Squarespace decision gets rather more complicated is when you want to start selling stuff. Both platforms facilitate e-commerce, but each comes with a set of pros and cons in the e-commerce department. Let’s look at a few key issues to consider if your aim is to build an online store with either Squarespace or Shopify. Squarespace offers four monthly pricing options, banded into two types of packages, 'websites' and 'online stores'. This is a little confusing, as you can technically sell products using three out of the four plans. Discounts for all of the above are available if you purchase a plan on an annual basis (the above four plans, respectively, work out at $12, $18, $26 and $40 per month when you pay upfront for a year's service). The above prices are exclusive of any applicable taxes. The 'Personal' plan does not let you sell anything. You will pay 3% transaction fees on any sales generated using the 'Business' plan. The 'Personal' plan restricts the number of contributors (i.e., authors / admins) to 2; on all other Squarespace plans you can have an unlimited number of contributors. To avail of an important feature, abandoned cart recovery, you will need to go for the most expensive 'Advanced' plan. The business plans and up come with more sophisticated options when it comes to pop-up messages, announcement bars and mobile information bars. 'Shopify Plus': pricing varies depending on requirements (but fees usually come in at around $2000 per month). 10% and 20% discounts on these prices are available if you pay upfront for an annual or two-year plan respectively. the abandoned cart saver functionality is available on all plans except 'Lite' — meaning that you can avail of this important feature considerably cheaper with Shopify than with Squarespace ($29 per month vs $46 per month respectively). professional reporting features only become available on the $79 Shopify plans and up. On top of the standard pricing plans, there are transaction fees and credit card fees to consider — the former being a percentage fee of your sales charged by your e-commerce platform (in this case Squarespace or Shopify), and the latter being the percentage fee of your sales charged by the company you choose to process your credit card payments (otherwise known as a payment gateway — we'll discuss these in more depth below). With regard to Shopify, you have the choice of either using Shopify Payments — Shopify's built in payment processor — or a third party payment gateway. If you use Shopify Payments, you avoid transaction fees entirely (i.e., Shopify will not take a cut of the sale). 0.5% on the 'Advanced Shopify' plan. It's important to note that these fees vary according to what country you're in — for example, in the UK, where we're based, Shopify credit card fees are significantly cheaper. With Squarespace, transaction fees are only applied to their 'Business' plan — the rate is 3%. In terms of the the credit card fees, the rate is determined by either Stripe or Paypal (the two options provided by Squarespace for processing credit cards). With Stripe, these fees vary based on what country you are selling from or to. In the USA, it's 2.9% + 30c per transaction; in the UK it's significantly lower at 1.4% + 20p for European cards (for now at least; let's see what happens after Brexit...) and 2.9% + 20p for non-European cards. Paypal rates vary by country too — the USA rates are available to view here. Shopify users elsewhere will need to use a different payment gateway — but the good news is that 100+ external gateways integrate with Shopify. Shopify can be used almost anywhere and in most currencies, because it allows you to use over 100 different ‘payment gateways’ (third-party processors that process credit card transactions). When Squarespace launched its e-commerce functionality, it worked with just one payment gateway, Stripe; this was not ideal, as Stripe only supports selling from a limited number of countries. More seriously, it was not possible to use Paypal with Squarespace, probably the world's best-known payment gateway — as a payment processor. Fortunately however, Squarespace have introduced a Paypal integration, which opens up more selling possibilities to Squarespace users. It is very encouraging to see Squarespace widen its range of payment gateway options, but overall Shopify remains the more attractive, flexible and professional option from a payment processing point of view — the number of payment gateway integrations is significantly larger (100+ versus Squarespace's 2), and as such the flexibility when it comes to accepting payments is much greater. Because you can only sell goods using Stripe from 26 countries, Paypal is left as the sole payment processing option for a lot of Squarespace users. (Note: for the avoidance of confusion, you can accept payment from anybody in any country using Stripe; but you can only sell using it if you are based in certain countries). So which works out cheaper, Squarespace or Shopify? If you just want to build a content-driven website — i.e., you don’t intend to sell anything — then on the surface of things, Squarespace offers a considerably cheaper way to do this, with its $16 per month 'Personal' plan. However, if you're serious about your content-driven website, you'll quickly find that the Squarespace Personal plan isn't all that great — it lacks quite a lot of very important functionality. The third restriction is possibly the most serious, because it rules ruling out design customisations that can't be made using the standard Squarespace controls. It also means that it’s hard (if not impossible) to add a GDPR-compliant cookie banner to your Squarespace site (I’ll discuss the fun issue of GDPR in more depth later on in this review). Accordingly, many users are probably best advised ignoring Personal Plan in favour of the more expensive 'Business' plan, which at $26 lifts all these restrictions and provides e-commerce functionality too. In terms of e-commerce, up until fairly recently, Squarespace allowed you to create a fully-functional online store considerably more cheaply than Shopify — at $16 per month, the old Squarespace 'Personal' plan allowed you to sell products and came in $13 per month cheaper than the cheapest Shopify plan which facilitated full online store construction. However, when Squarespace adjusted their pricing structure to remove e-commerce functionality from the 'Personal' plan, they basically created a situation where there's little difference in pricing between the cheapest Squarespace and Shopify 'full' e-commerce plans (i.e., the plans which allow you to build a complete, standalone online store). You now pay $26 per month for the Squarespace 'Business' plan versus $29 per month for the Shopify 'Basic' plan. When you consider that Squarespace charge 3% transaction fees on their 'Business' plan, and offers a very limited range of payment processing options with it, it's hard not to conclude that the Shopify plan represents better value as far as e-commerce is concerned, even if the monthly fee is a little bit higher. (And this sense of 'better value' gets more pronounced when you compare e-commerce features — more on all these below). Of course, of the two products under discussion, Shopify still technically offers the cheapest way into online selling, with the $9 Lite plan. This plan is more geared towards people who want to sell on an existing website (or social media site) rather than build a new one, so functionality is more limited than the entry level Squarespace offering; but if this approach suits you, you'll appreciate that the monthly costs and transaction fees are both considerably lower than on the cheapest Squarespace plan. We offer both Squarespace and Shopify website design services — contact us today if you need help with your build. Or check out our Squarespace plugins store to add more functionality to your existing Squarespace site. When it comes to the feature sets of both products — and as you might expect — Shopify’s heritage as an online store building solution generally trumps Squarepsace’s. integration with a very extensive range of third party apps that extend the functionality of your store significantly (apps include integrations with Quickbooks, Zoho and Zendesk to name just a few). as we've discussed, a much wider range of payment gateway options. Shopify and Squarespace's interfaces aren't a million miles apart in terms of layout; both present you with a menu on the left hand side of the screen which you can use to navigate to different parts of the CMS (settings, site design, analytics and so on); the right hand side of the screen can be used to edit content, view data, add products and so on. On the whole I would say that Squarespace's interface is the more elegant of the two, and is arguably a bit easier to use than Shopify. Its approach to setting up site navigation and its easy-to-use 'layout engine' (which allows you to drag and drop content into pages in a very user-friendly way) make it very straightforward to use. Whilst by no means difficult to use, Shopify’s user interface is arguably not quite as slick, and setting up pages and products can take slightly longer than in Squarespace. One aspect of the Shopify interface which definitely trumps Squarespace's though is 'responsiveness'. Squarespace can occasionally a bit sluggish, and occasionally a little bit buggy (the layout engine — whilst great in many respects — can behave in an odd way when you try to drag certain bits of content into position, and it seems to work better in some browsers than others). I've also found Squarespace to crash more often than I'd like, particularly when uploading or editing images; and I've lost a few blog posts in Squarespace when the platform hung up on me mid-posting. Finally you really have to be using quite a decent machine to get the most out of Squarespace; older or slower computers will cause it — and you! — headaches. In the stability and smoothness stakes, Shopify is in my view the winner. In essence, its less flashy CMS also seems the more 'solid' and reliable. As discussed above, Squarespace templates are gorgeous. Although this is a subjective area, I feel they are a bit more contemporary or varied in nature than the free templates from Shopify. There are also more templates to choose from in Squarespace: you can choose from around 22 template ‘families’ (many of which contain several different ‘sub templates’) to Shopify's 10. That said, there's a very wide range of Shopify paid-for templates available — more on these in a moment — and the 10 templates that are provided with Shopify contain a few variants for each theme, meaning there are actually more free options than the number ten suggests. There's definitely a 'wow' factor with certain Squarespace templates that sets them apart from similar website building and e-commerce platforms. However, a lot of templates — and this is in keeping with the issues discussed above regarding content presentation vs selling online — are geared towards users who want to blog or showcase an art, photography or music portfolio. Of the 90 or so individual Squarespace templates available, only a few are dedicated online store ones (that's not to say, however, that you can't sell products using the others — you might just have to play around with the design a bit more first). Depending on your chosen Squarespace template, you'll find lots of nice visual effects in play, such as parallax scrolling and text that gracefully fades in and fades out as users scroll through a site. Squarespace templates can be further enhanced, thanks to built-integrations with Unsplash and Getty images. These provide you with a very easy way to add stock images to your website — when adding a picture to a page, you can simply use a search box to find something suitable on either service. Both integrations are great and are particularly helpful for bloggers who need to find strong images quickly to accompany their posts, or Squarespace designers who are working on sites for clients who have not supplied any photos. The Unsplash integration is particularly welcome, given that the quality of its free images is in most cases very high. And if all that wasn't enough, Squarespace makes it really easy to use video backgrounds on any page — you can now select any Youtube or Vimeo video as a background for the banners on your pages, with stunning results. You just enter the relevant Youtube or Vimeo URL into your page settings and Squarespace will use it as the background. You also get a few video playback speed options and colour filters to play with. However, Shopify is by no means a slouch in the template / visuals department. The Shopify free templates are aesthetically pleasing and arguably better than a lot of the ‘out-of-the-box’ templates provided by competing products such as Volusion or Bigcommerce. Additionally, if the 10 free Shopify templates don't meet your requirements, there is a Shopify template store that you can buy a snazzier template from. There are 60 paid themes to choose from, most of which contain several variations, which means there is arguably a wider range of templates available from Shopify than Squarespace — so long as you are prepared to pay for them (prices vary but typically involve a one-off payment of between $140 and $180). The paid-for Shopify templates are similar in quality to the Squarespace ones, offering a wide range of layouts which include contemporary design features such as video backgrounds and parallax scrolling. Additionally, the Shopify theme store is really easy to use — you can browse all the available templates really easily thanks to a range of controls which let you filter by layout style, industry type, size of store and so on. All the Shopify and Squarespace templates are responsive, meaning that your templates automatically resize themselves to suit the device they are being viewed on — mobile, tablet or desktop computer. For me, the bottom line with templates is that both Shopify and Squarespace provide a wide range of attractive options, with Squarespace — as you might expect — being the more obvious choice for content-driven websites, and Shopify being the more obvious choice for those wishing to create an online store. Let’s move on now to getting products in and out of both platforms. Both Squarespace and Shopify give you the option to import products. With Shopify, you can import products using a CSV file only. The fact that you can import from more third-party stores into Squarespace means that it has a bit of an edge in this department. When it comes to getting your product data out of both platforms, Shopify is the more flexible tool. This is because Shopify lets you export all your products, irrespective of type (to a CSV file). Squarespace by contrast only facilitates exports of physical and service products, and it limits the number of products you can export (to 2,000 products, with each variant counting as a limit). And on top of that, it limits the number of product options you can export to 3. So if you want to keep your options open regarding migrating to another platform down the line, Shopify is the safer bet. Another area which I feel is handled better by Shopify than Squarespace is search engine optimisation (SEO). First, for all products and pages, Shopify generates a page title and meta description automatically, which a lot of the time — particularly where products are concerned — often provides a very good SEO starting point. Second, Shopify refers to the core SEO elements by their proper names; this is not always the case with Squarespace. In Shopify, you're dealing with titles, meta descriptions, alt text — all the standard terminology you'd expect. In Squarespace however you often encounter things like 'captions', 'descriptions' and 'excerpts' — all of which can be used for SEO purposes but can also, if you're not careful, or using certain templates, end up visible on your template. Squarespace have improved the SEO setup a little bit lately, making it easier to enter SEO titles and meta descriptions for static pages, but further improvements are still needed, particularly when it comes to adding alt text to images, or meta descriptions to blog posts — non-standard and confusing terms are still being used. Despite the shortcomings of the Squarespace CMS when it comes to SEO, it should be noted that it is definitely possible to optimize a Squarespace site well for search — see our Squarespace SEO tips for some important advice on how to make a Squarespace site rank in search results. It’s just that the Squarespace SEO options could be much better implemented. Finally, Shopify handles URL redirection better than Squarespace. If you change a page's URL, Shopify will prompt you to create a 301 redirect to that page (if you tick a checkbox, this is done automatically for you). A 301 redirect lets search engines know that the page has moved, and preserves any 'link juice' associated with it. In Squarespace, if you change a page URL, you will have to manually create the 301 redirect (the process for which is fiddly; and creating 301 redirects is quite easy to forget to do). One area where both products could improve a bit involves URL creation. Neither allows you to create truly 'clean' URLs — something that Google prefers - because they stick content identifiers into some URLs which can't be removed (for example, /blog/, /products/ and so on). Squarespace is a little bit more flexible on this - static pages don't include these prefixes. On the whole though, Shopify's approach to SEO is much better than Squarespace's. (Note: for a rundown of how to optimize a Shopify or Squarespace site for search engines, you might want to check out our Shopify SEO and Squarespace SEO guides). A key feature offered by Shopify which is not currently provided by Squarespace is 'point of sale' (POS) kit. This works with both iOS and Android mobile devices and allows you to sell easily not just online but in actual physical locations too. The point of sale kit comprises a barcode scanner, card reader, cash drawer and receipt printer - you can buy any of these items individually or as a package (or alternatively use compatible third party hardware). There are a wide range of applications for Shopify's POS system: it allows you to sell in a pop-up shop, from a market stall, at an event or even in a permanently located retail outlet, whilst keeping your inventory and stock count automatically synced. To be fair, you could theoretically use your Squarespace store to sell in physical locations too, but you couldn’t use chip and pin or print paper receipts for clients; you would have to ask them to enter their card details into a laptop or tablet, and they'd receive an email receipt. Many people who dip their toes into the waters of online retailing do so because they want to start dropshipping products. Dropshipping is a method of online retailing where you don't keep what you're selling in stock — rather, you take the order, send it to a supplier, and they send the goods to the client. Your online store, in effect, becomes a front end / middle man for another business. The plus side of this business model is that it doesn't involve much investment to start your business; the down side is that margins tend to be quite low due to high levels of competition. If you're interested in starting a dropshipping business then Shopify is a much better bet than Squarespace. With Shopify there are a wide range of dropshipping apps available to help you source and sell inventory — a popular choice being Oberlo — but there's no easy equivalent way of dropshipping in Squarespace. One option for dropshipping in Squarespace could actually involve Shopify: you could use a Shopify Lite plan and a dropshipping app to add a 'buy button' onto your Squarespace site. Alternatively, using Shipstation in conjunction with Squarespace could present a workaround. It's all a bit fiddly though, and way more hassle to set up than in Shopify. For more information on this topic, you may find Shopify's free webinar on dropshipping useful. These are available for both iOS and Android. Of the above, most users are realistically going to appreciate 'Blog' and 'Commerce' apps the most, as these allow you to publish blog content and manage e-commerce orders on the go. 'Analytics' is pretty useful too and does what you might expect it to: look at your site stats on a smartphone. 'Portfolio' allows you to download the content of your Squarespace galleries to your phone so that you can show people your images on your phone when you don't have internet access. (I'm not 100% sure I quite see the point of this, unless you intend to show your portfolio to a lot of folk on airplanes). The ‘Squarespace’ app is a relatively new addition to the range of mobile apps provided by Squarespace. At the moment it allows you to edit content and manage comments on your site (note that it doesn’t seem to cater for e-commerce yet though). My hunch — although I may be wrong — is that eventually this app will become the main Squarespace mobile app, incorporating the functionality provided by all the others. Shopify provides quite a few apps two, but there are 2 main ones which will be of relevance to the majority of users — first there's the main Shopify app, which allows you to edit certain aspects of your Shopify site, view basic stats and check in on orders. There's also a Shopify app dedicated to its POS (point of sale) functionality — this allows you to take orders and accept payment for goods in a physical location. The above two apps are all you need really to run a Shopify store on your mobile, but if you want more, you can pick up some other Shopify apps — these include a business card maker, a logo maker and a magazine for entrepreneurs. There's also an iOS-only app called 'Ping', which makes it easier to manage queries and share your product details with customers when chatting with them over Facebook Messenger. More chat services will be supported soon apparently. So what to make of this plethora of apps? It's fair to say that despite the fact that both Squarespace and Shopify seem to offer a multitude of apps, they are actually taking a slightly different approach to mobile app provision. With Squarespace, you currently need to download more than one to manage your site on a smartphone; with Shopify, you should generally be able to make do with just one. But it looks as though Squarespace is heading in a similar direction to Shopify on this front. As things stand, I suspect Shopify's approach will be more convenient for most users, but that said, the Squarespace apps are currently designed more with specific actions in mind (publishing a blog post, viewing stats etc. ), meaning that they are might be better suited to individual tasks at hand. If you're selling digital goods to consumers in the EU, and you expect to make over €10,000 per year doing so, there's something you may need to watch out for when making a decision between Squarespace and Shopify: VAT MOSS ('VAT Mini One Stop Shop'). Basically, when your business sells a digital product to consumers in EU member states, value added tax (VAT) must be charged at the rate due in the consumer’s country. With Squarespace, these different rates all have to be entered in manually as individual 'tax rules'; Shopify will however calculate these automatically for you, potentially saving you a lot of time. (An alternative workaround for VAT MOSS in Squarespace is to charge the same fee for products regardless of the countries involved, and retrospectively calculate and pay the relevant amount of VAT for each country to the tax authorities. Check with your bookkeeper or local tax authority first though to see if this is kosher...). SSL is the standard security technology for establishing an encrypted link between web servers and browser, and using it ensures that all data passed between a web server and browser remains private. (You can spot a site using SSL when you see a URL beginning with "https://" rather than "http://"). There's also another benefit to having SSL installed on your site: Google treats it as a 'positive signal' when ranking your site in search. Up until relatively recently, it was another win for Shopify here, because Squarespace only used SSL on its e-commerce pages and didn't allow you to install custom SSL certificates to cover other parts of your site. The good news now is that like Shopify, Squarespace now provides a free SSL certificate which you can use with any domain. Once potentially tempting feature of Squarespace is that when you purchase one of their plans (and pay annually) you get a free custom domain with it; although you can use Shopify to register a custom domain too, there is a cost associated with this (domain names start at $11 per year). You can also buy domain names separately through Squarespace too, if you like. The advantage of sourcing a domain from either Squarespace or Shopify is that (assuming you intend to use these services to host your site), you won't have to worry too much about the technical side of configuring DNS settings — connecting your domain to your Squarespace / Shopify site will be a pretty straightforward affair, with the settings pre-configured for you. The disadvantage is that you are placing all your eggs in one basket — if for whatever reason you lost access to your Shopify or Squarespace account, and you had bought a domain from these companies, you would be losing access not just to your CMS but your domain too. And from an SEO point of view, a domain is hugely important to a business (particularly established ones). Ultimately I think its safer to buy a domain using a third-party provider, and tweak the DNS settings (which is not a terribly complicated job anyway) to map the domain to your Squarespace or Shopify website. That’s what I generally recommend that our clients do. In terms of what domains are available to buy direct from either Squarespace or Shopify, you'll find that they don't offer as many TLD (top level domain) options as you'd find with a dedicated domain name provider (for example, you might not find that your country's TLD domain is catered for). One thing that I feel is handled considerably better by Squarespace than Shopify is product images. With Shopify, unless all your images have a consistent aspect ratio, they will be laid out in a pretty incoherent manner: visitors to your site will see a mish-mash of differently sized image photos in the product catalogues. There are two ways to get around this: first, you can manually edit all your images in Photoshop or other image editing program so that they all have the same aspect ratio...but this is a bit of a pain. Alternatively, you can make use of a third party Shopify app such as Pixc to resize images on your store automatically after you upload them (Pixc handles 150 images for free and charges a monthly fee of $0.05 if you go over this). Neither workaround is ideal if I'm honest, and it would be better if Shopify just allowed you to set a standard product image ratio out of the box. Squarespace provides a better approach: you pick an aspect ratio for your product images and the system will automatically crop all your pictures to that ratio. If you like, you can specify a 'focal point' for individual product images in Squarespace — this part of the photo will be emphasised within the cropped image. In an era of responsive websites, this focal point feature is important because it helps ensure that the main part of your image is foregrounded whenever your image is automatically cropped for viewing on smaller screens. Editing an image's focal point in Squarespace. If you're looking for a platform with professional reporting functionality, then Shopify is a better option than Squarespace. Although the Squarespace reporting offering has improved quite a bit recently, the stats provided are still of a more basic nature than those found in Shopify. And what's more, you can use Shopify to create your own custom reports too. There is a negative aspect of Shopify's reporting offering which is worth pointing out however: it's only available on their more expensive plans. The pre-defined reports are available on the $79 'Shopify' plan and up; and to avail of custom reporting you'll need to purchase an 'Advanced Shopify' or 'Shopify Plus' plan. If you don't opt for one of these plans, you'll just get access to a rather basic 'dashboard' report containing topline figures only. You could of course use Google Analytics to get around this, but you'd need to do more manual configuration and 'goal-setting' to get at the sales data you need. Similarly, Squarespace charges a premium for more advanced reporting features - if you want enhanced commerce analytics, you'll need to be on one of the more expensive 'online store' plans. Blogging is an often-overlooked, but extremely important aspect of running an online store. This is because blogging is absolutely vital to inbound marketing — where you use quality content (blog posts) to drive up traffic, and by extension sales. The good news is that both Squarespace and Shopify provide blogging functionality - this is not true of all e-commerce platforms, notably Volusion. In terms of which is better, I'd say Squarespace's blogging functionality has a slight edge over Shopify's. This is chiefly because you can do more with the blog content — you can drop it easily into any page or sidebar of your site using attractive and flexible 'summary blocks'. You can also add both categories and tags to posts in Squarespace; Shopify just permits tags. A very big difference between Shopify and Squarespace is that Shopify has an app store that you can use to purchase integrations with other apps; the latter doesn't. Shopify's app store contains thousands of integrations with other platforms; additionally, it contains apps which have been developed to add specific pieces of functionality to Shopify stores (for example SEO enhancements; dropshipping functionality; multiple currency support - and much else besides). That's not to say that you can't integrate other apps with Squarespace — you can. There are a few 'official integrations' available out of the box with Squarespace (available on the 'Business' plan and up) - these include Xero, Dropbox, OpenTable, Soundcloud, Twitter and quite a few others. Accelerated mobile pages (AMP) is a new, Google-backed, format for content which makes it load really fast on mobile devices. It does this by stripping out certain bits of code from your site and delivering a slimmed down version of your content to smartphone users. AMP pages create a better user experience than normal responsive pages; because they load more or less instantaneously, people viewing AMP pages are far more likely to stay on your site (and by extension buy stuff). Google also occasionally prioritises AMP pages in search, by featuring them in carousels above standard search results. In Squarespace, you can enable Accelerated Mobile Pages ('AMP') format really easily — it's simply a case of ticking a checkbox in your site's setting - but at time of writing it is only available for blog posts, not products. To use AMP on Shopify sites, you'll need to do a bit more work - you'll need to install a third-party, paid-for app like RocketAmp or FireAMP. However the Shopify apps allows you to display ALL your site content (including, crucially, product pages) in AMP format. So providing you're prepared to put in a little bit of effort (and cash) with Shopify, you'll end up with a better AMP version of your site. Squarespace has recently been making quite a lot of noise about the fact that it partners with Google to offer Squarespace users a G Suite (formerly Google Apps) integration. You can sign up for G Suite when you purchase your Squarespace plan - and if you're on a 'Business', 'Basic' or 'Advanced' plan, you'll get a year's free G Suite plan (for one user). This functionality is easily accessible through the G Suite admin panel, so the integration isn't that mind blowing. More appealing is the year's free account. Squarespace does integrate nicely with G Suite in one particular respect: you can connect data capture forms to a Google Sheet, meaning that you get a handy real-time overview (or indeed archive) of any form submissions made via your website. This will work with any G Suite account, regardless of whether you purchase it via Squarespace or independently. In terms of using Shopify in conjunction with G Suite, there's nothing to stop you doing that - you will need to edit your DNS settings manually to get the email accounts to work, but that's a fairly simple, 5 minute task. With Shopify you get very extensive control over the coding of your site - you get full control over the HTML and CSS of your website (on all plans except the 'Lite' one). With Squarespace, you can edit the CSS and certain bits of HTML (you can insert code blocks onto pages, or inject HTML into the header of your site) but you should be aware that the Squarespace support team essentially reserves the right not to support you fully if you've added HTML or CSS to your site. The other thing worth remembering of course is that you can only add CSS to your site and inject code into your page headers if you're on a Squarespace 'Business' plan or higher — the 'Personal' plan disables this functionality. As discussed earlier, there is a developer version of Squarespace available which does provide users with extensive control over every aspect of the design of their site - but you will need strong coding skills to be able to work with it. As the name suggests, you will ideally need to be a developer. Again, developer mode is only available on 'Business' plans or higher. (For the record, what I'd *love* to see one day is a halfway house between the standard version of Squarespace and the developer's platform — maybe a product called 'Squarespace Pro' which, like the original versions of Squarespace, allowed you to tweak every element of your website and edit the CSS of your site easily). A very important feature of running a website is capturing email addresses: your ability to communicate effectively with leads via e-newsletters is vital to business growth. Both Squarespace and Shopify allow you to capture email addresses to an email marketing solution of your choosing. 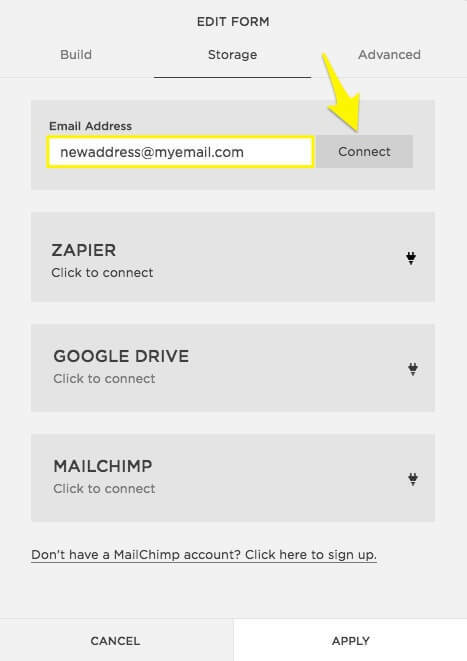 If you are a Mailchimp user, you’ll find Squarespace an easier option, because it allows you to link your Squarespace and Mailchimp accounts together very easily — it’s simply a case of selecting ‘Mailchimp’ as your form storage solution and clicking an ‘authorize account’ button. If you’d prefer to use another email marketing tool with Squarespace (such as Getresponse or Aweber) you’ll probably have to use Zapier to create an integration between the app and your Squarespace site, which can result in additional costs and set up time. If you’re happy to send email addresses to Google Drive or your own email account, this is very easy with Squarespace. As for Shopify, although integrating Mailchimp isn’t quite as straightforward as Squarespace, an official app nonetheless exists for it, so it isn’t too hard. Same goes for competing products like Aweber and Getresponse. The bottom line on data capture is that Squarespace makes it slightly easier to do for Mailchimp and Google Drive users; but more official integrations for other leading email marketing apps exist for Shopify (Squarespace users will need to create their own integrations for other products using Zapier). Shopify definitely has the edge over Squarespace in the support department. Shopify provides you with live chat, email and (crucially) phone support — Squarespace offers only live chat and email support. If I was paying $46 a month for a Squarespace account, I'd expect phone support. It's a bit unclear however what countries you can avail of Shopify phone support from; phone numbers are only listed for North America, the United Kingdom, Australia and New Zealand. A note of caution is worth sounding regarding the support offered with both Shopify and Squarespace — the quality of support you'll get often depends on what you're doing with your template. For example, if you're using one of the standard free Shopify templates (i.e., the ones developed by the company itself), you can expect fairly comprehensive support if it's not behaving as it should. But if you opt for a third-party, paid-for template, you may have to deal with the designers of that template if you run into trouble. And how good that support is will depend on the designers in question. Similarly, Squarespace's support team are pretty good at assisting with template related queries...unless you customize it by adding your own CSS or HTML to it, in which case the Squarespace support team effectively reserve the right not to support you fully. I've had more experience of Squarespace’s support than Shopify’s, and it's varied from being brilliant (when dealing with technical issues to do with SSL) to appalling (when dealing with GDPR-related enquiries). One thing that is likely to annoy both Squarespace and Shopify users is that before you get to see any contact details for their support teams, you need to search for an answer to your problem first on the Shopify and Squarespace help sites. I can see the rationale for this, but I think that many (most?) users will have already searched for a solution to their problem before getting to the point where they want to contact a support team — and this approach feels like its making customers jump through unnecessary hoops. I am not a lawyer, so please note that the below observations should not be interpreted as legal advice, but I'm going to do my best to spell out some of the key GDPR issues facing Squarespace and Shopify site owners in this section. As you will have probably spotted — as a result of receiving a load of emails recently from companies asking you to resubscribe to their mailing lists — business and website owners now have a lot of additional legal responsibilities as a result of the new GDPR (General Data Protection Regulation) rules introduced by the EU in May earlier this year. Provide a means to opt in or revoke consent to use of non-essential cookies on a website (and to log that consent). Now, meeting the first three requirements with either Squarespace or Shopify is fairly straightforward (although you will have a bit of legwork to do in terms of creating GDPR compliant privacy policies and data capture forms). Meeting the fourth requirement however is harder, and in my view Squarespace and Shopify should be doing more to assist their customers to meet this GDPR obligation (particularly Squarespace). Basically, whenever you use non-essential third party cookies on a website — for example a Facebook Ads pixel or a Google Analytics tag — you are legally obliged to give EU visitors to your website the option to switch these off BEFORE they continue to browse your site (even if your site is based outside of the EU). You are also obliged to log EU users' consent to any non-essential cookies being used, and give them the option to revoke that consent at a later stage. Cookie banners are usually used to facilitate this, but the old 'By using this site you are consenting to cookie usage...' statement on a banner is not good enough any more — you need something far more sophisticated. Sadly, out of the box there is no way to facilitate this kind of GDPR cookie consent for third party scripts on either Shopify or Squarespace, meaning that many (if not the vast majority of) Squarespace and Shopify users end up breaking the law as soon as they add a third-party cookie to their website. make use of a third party solution. It’s probably fair to say that most Shopify and Squarespace users (people who are probably using code-free store builders for a reason!) are likely to plump for the second option; and based on my research into this area so far, it seems that Shopify is the more flexible platform when it comes to integrating third party cookie banners. For a start, there are quite a lot of apps in Shopify's app store which provide GDPR-compliant banners and cookie consent functionality (note that some seem considerably better than others — if in doubt about how robust a particular Shopify GPDR app is, consult a lawyer!). Alternatively, with a bit of configuration, products like CookiePro or Cookiebot can be used to capture cookie consent for Shopify sites. As for Squarespace, because it doesn't provide an app store, there are no dedicated apps to solve this problem. And my own appeals to their support team for help on this issue have proved pretty fruitless! Thankfully though, there is a solution, involving OneTrust’s CookiePro product. It’s a bit of a time-consuming thing to set up, and a slightly complex process is involved, but it does work nicely — for a full overview of the steps involved, check out our guide on how to add a GDPR-compliant cookie banner to a Squarespace site. Bottom line on GDPR: you can make a Shopify or Squarespace site GDPR-compliant, but it will involve some work (and ongoing fees, if you're using a third party cookie banner solution), with Shopify providing you with more options to solve the problem. Which is better, Shopify or Squarespace? Well, the answer to this question is a big fat ‘it depends’. If your primary aim to build an attractive website to showcase content, then Squarespace is definitely your best bet. I'd argue that this is particularly the case if you're working with images — Squarespace is particularly good for creating online photography portfolios with — or are a musician / band. If you are hoping to build a content-focused website or a blog and sell a couple of products on the site as well, then Squarespace is probably still your best bet, so long as you are happy with the fairly limited payment processing options — and you don't need to charge EU VAT on digital goods (or are prepared to put a bit of time into setting up a lot of tax rates manually). However, if your aim is to create a large online store with advanced functionality, professional reporting and a big inventory of products, then Shopify is unquestionably the more robust solution — its feature set and payment gateway options are significantly more extensive, and it allows you to export your product data, something Squarespace does not currently permit. And with its VAT MOSS functionality, it's arguably better for selling digital goods. Although both platforms could be better in the area of GDPR, it’s fair to say that merchants wishing to have a high level of compliance on their website will find that this is probably easier to achieve with Shopify, especially in the area of cookie consent. Interestingly, if you prefer the general vibe of Squarespace, or have an existing Squarespace site that you're really happy with, but would you'd like to add e-commerce functionality to, you could also consider using Squarespace AND Shopify in conjunction with each other: you could use the 'Shopify Lite' Plan to integrate the Shopify Buy Button, cart and checkout onto a Squarespace site. I've seen quite a few users do this successfully (another option for beefing up the e-commerce functionality on a Squarespace site is Ecwid). With Shopify, you can export all types of products; in Squarespace you can only export digital ones. Abandoned cart saver functionality is available at a considerably lower price point with Shopify. You can run a dropshipping business more easily with Shopify. There is a huge library of third party apps that work with Shopify and extend its functionality significantly — although some integrations are available for Squarespace, you won't find a similar catalogue of apps to beef up your site / store. Shopify provides you with significantly more choices when it comes to payment gateways. If you intend to sell products in-store or at events, you will find Shopify's Point of Sale options extremely useful; Squarespace doesn't yet offer this kind of functionality. Shopify permits more advanced control over the HTML and CSS of your website (note: Squarespace does provide advanced control too, but only if you're using the developer version). Reporting is better in Shopify than in Squarespace, although you'll need to be on a more expensive plan to access this functionality. Thanks to the fact that EU VAT is automatically calculated for you on digital goods, Shopify makes selling products to EU customers a lot more straightforward. Shopify provides more comprehensive support than Squarespace, including phone support. Shopify's 'Lite' plan allows you to start selling online and at point-of-sale very cheaply (but note that it won't provide you with a fully-fledged online store). Shopify's navigation builder allows you to use more levels of navigation than Squarespace (for desktop versions of your store). Shopify’s SEO functionality is better. It's easier to meet GDPR requirements with Shopify than it is with Squarespace, mainly because more third-party apps which provide cookie consent functionality are available for Shopify. You can — albeit with the use of a third-party app — create AMP versions of product pages in Shopify. There are more template variations available in Shopify (but you will have to pay a premium to use many of them). Only one smartphone app is required to manage key aspects of your site on the go. A free trial of Shopify is available here. The quality of bundled templates is arguably a little bit higher in Squarespace than in Shopify — they have more 'wow' factor (note that the paid-for Shopify templates are of a similar quality, however). There are also more free templates to choose from. If your main aim is to showcase content, particularly images, then Squarespace is the more elegant, flexible solution. You can search for and add Unsplash images directly to pages on your Squarespace site — this is a great (and free!) way to source images for your website. You can buy Getty images very cheaply with Squarespace and integrate them easily onto your site. Squarespace is arguably slightly easier to use than Shopify. Squarespace allows you to host a fully functional online store slightly cheaper than Shopify. Product images are handled considerably better by Squarespace. Blogging features in Squarespace are better than the Shopify equivalents. Depending on whether or not you have an existing G Suite account, you may be able to avail of a free G Suite plan for a year by purchasing it through Squarespace. Mailchimp and Google Drive users will find it easier to integrate these products into a Squarespace site. A free trial of Squarespace is available here. And finally, a reminder that we can help you build both Shopify and Squarespace websites! Please do contact us for more information on how you can get a Shopify or Squrespace website off the ground quickly and professionally with Squarespace. If you’d like to try another solution before committing to either Squarespace or Shopify, Bigcommerce is definitely worth a look because it is feature-rich and very easy to use (it's particularly good when it comes to providing merchants with the option to add a wide variety of product variants). You may also find some of our other e-commerce platform reviews helpful – just see the 'related articles' section below for a list of recent posts. If you've used either Shopify and Squarespace (or both! ), it'd be great to hear your thoughts on both products — feel free to post your comments or questions on either platform below (smartphone users: you may be reading an ‘amp’ version of this post, in which case click here for a version which facilitates commenting!). Also, if you've found this post useful, it'd be wonderful if you could consider sharing it on social media or creating a link to it on your blog / website. Thanks for reading! For excellent free resources on all aspects of running an online business — from website building to SEO to email marketing — make sure you subscribe to our updates via email. You'll receive e-newsletters containing all our latest advice and reviews: essential stuff for kick-starting your business. Click here to subscribe for free today.